The snow was pretty deep this trip! Last weekend we had our 3rd annual winter trip with our friends, Jim and Lynda up to Algonquin Park. 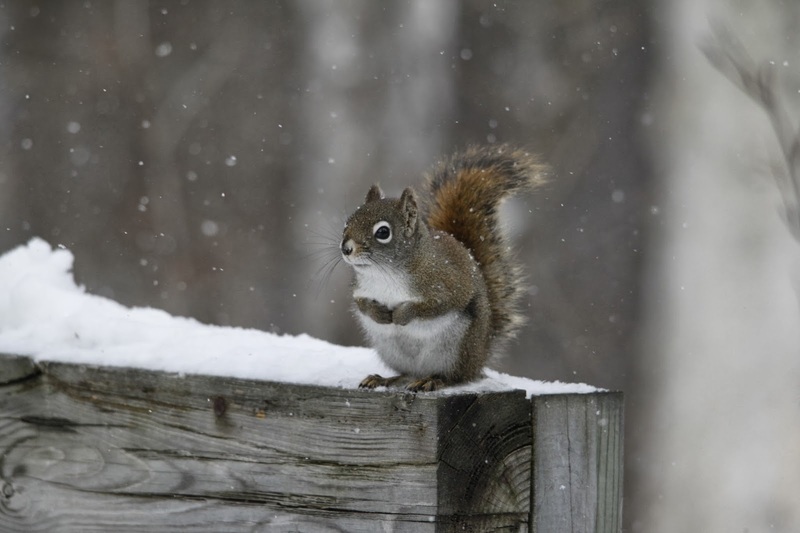 We all love Algonquin Park and every season offers something different. 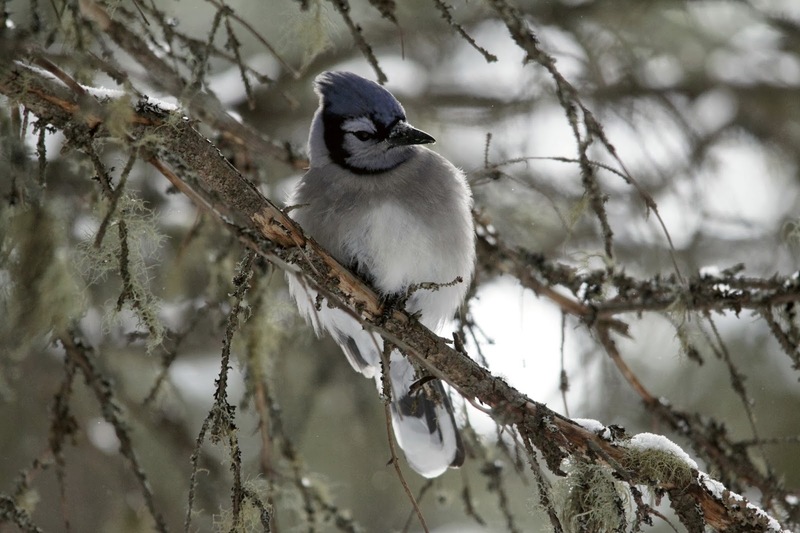 For me, the winter trip is all about seeing the Gray Jays. The beautiful Gray Jay on one of the many trails. 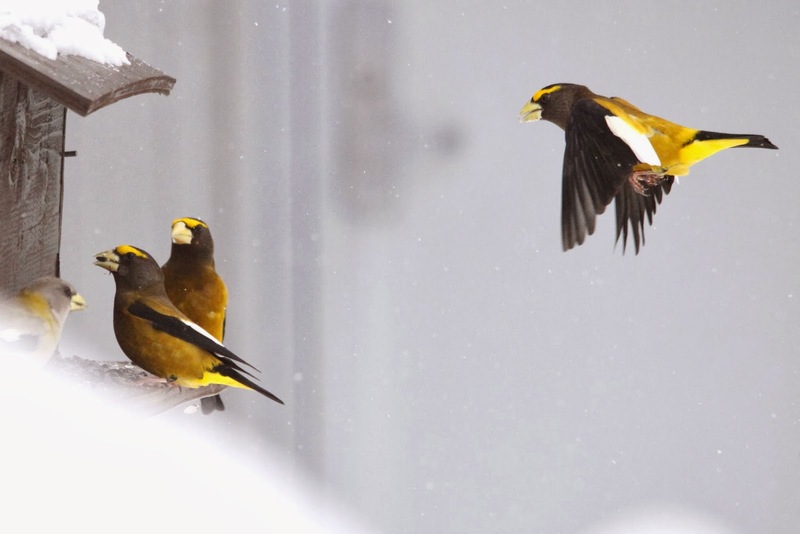 We also saw lots of great birds at the visitor centre feeders. 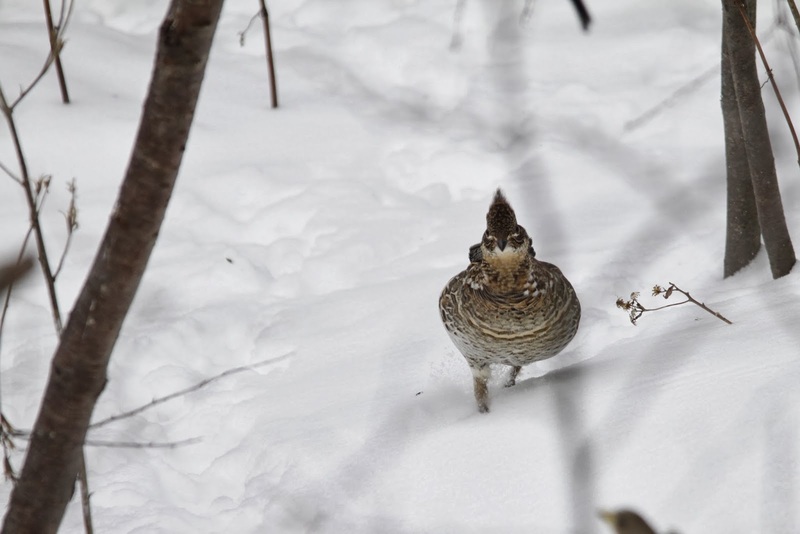 It was fun to watch this Ruffed Grouse waddle in for some seed. We saw more Blue Jays in the park this trip then ever before, both at the visitor centre and on the trails. Loud, but I love em! Hand feeding a Chickadee - instant smile! 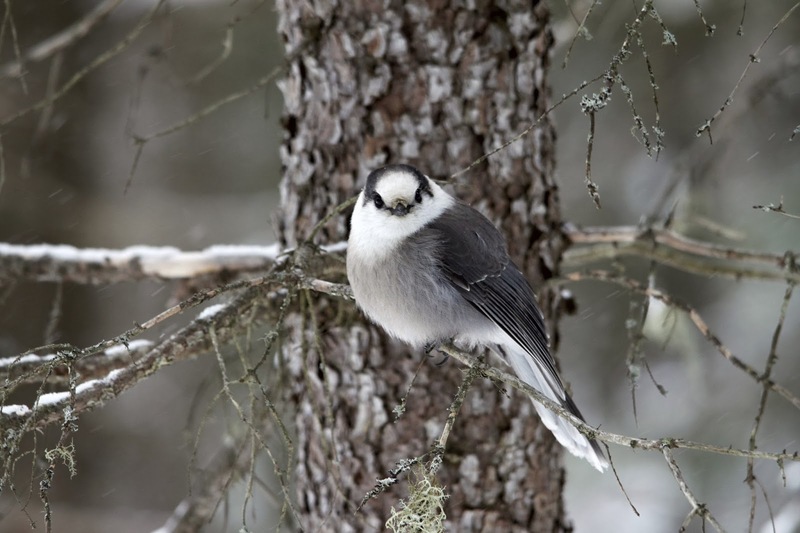 Algonquin Park is the only place we have ever seen Gray Jays. This little guy was waiting for us on Spruce Bog Trail. There always seems to be that one memorable moment on every trip with Jim and Lynda. That moment that will come to my mind first in the years to come when I think back on the trip. This year it was a Gray Jay Snow Angel and the laughter that happened after. 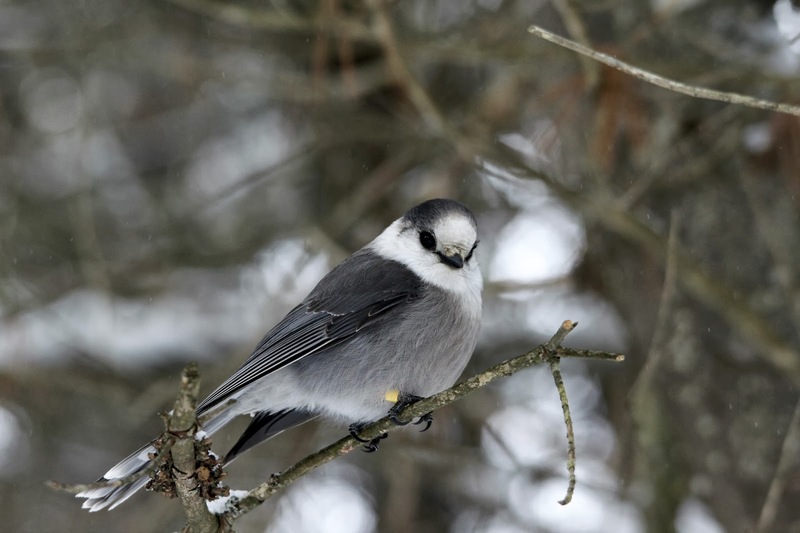 We were on the back part of the Mizzy Lake trail and were headed back to the van to call it a day, when out of the blue a small group of Gray Jays arrived and were quite willing to take peanuts from our hands. One of them flew down into the snow, I think he thought he could land on it. 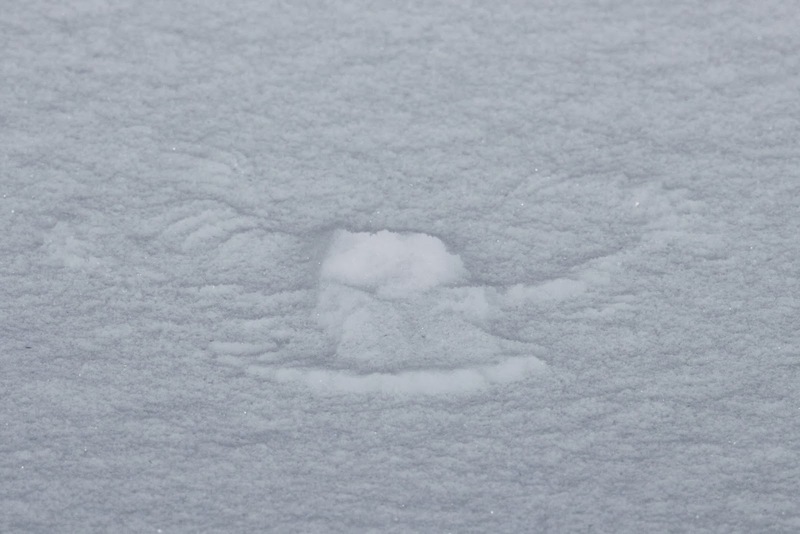 It happened so fast that no one got a picture of how beautiful he looked with his wings spread out in the snow, but we all saw it. 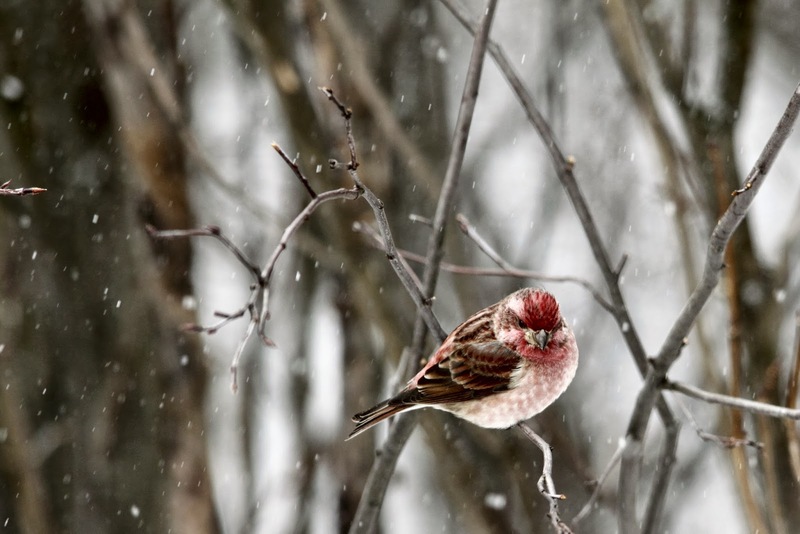 After he flew away I noticed the outline of his feathers in the snow, natures artwork at it's finest. It was difficult to get a picture of, but if you look close you can see the outline of his wing and tail feathers. I of course wanted to get a closer look and stepped off the path, bad idea! The snow was up past my knees! After Jim stopped laughing at me, he did help me out of the snow. The Gray Jay looks on in amusement. It was a memorable way to end another great outing in Algonquin Park! You can check out our first winter Algonquin trip by clicking here, and last years trip here. The Gray Jay and Ruffed Grouse would be lifers for me. Hopefully, we'll get up to Algonquin in the fall when John has some time off. p.s. my word verification was 'true love' today. Sweet! Oh, and Happy Valentine's Day to you! Wonderful series of pics, Angie! I've never some of the birds you highlighted in this post. Perhaps one day, I'll be able to visit the park and capture some of the magic.